All doctoral students affiliated with Malmö University through their research are welcome to join the Doctoral Student Union (DSU). The membership fee is 120 SEK / semester which you can transfer to Plusgiro 654080-1. Please include your name and your Swedish personal number when you make the transaction. 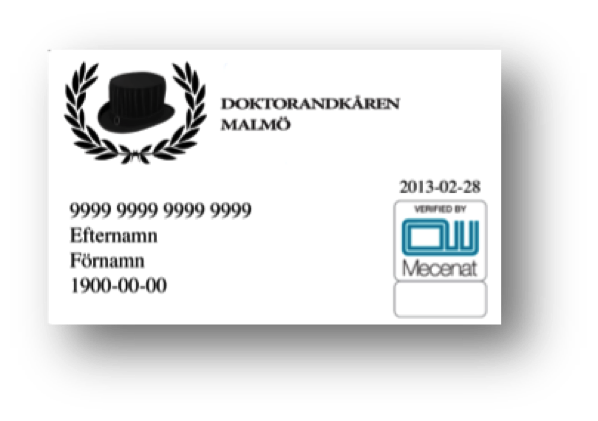 Once you have completed the payment, please send us an e-mail to members.dsu@mah.se, stating your name, home address, Swedish personal number, faculty, and degree of employment. Transfer 120 SEK to Plusgiro654080-1. Include your name and your Swedish personal number when you make the transaction. Send us an e-mail to members.dsu@mah.se if your address or degree of employment has changed. I’ve made my payment, when will I receive my card? You will receive your Mecenat card by post a few weeks after we have registered your payment. In the meantime or in case you don’t like to carry a lot of stuff, you can download Mecenat’s app and have the digital version of your card in your smartphone. Problems with your Mecenat card or additional membership questions?